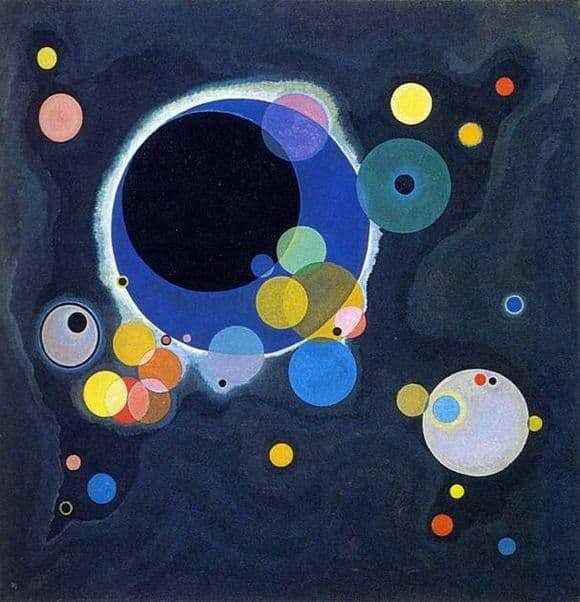 The painting “Several circles” was written in 1926. Materials for writing the work served as oil and canvas. The size of the canvas is 140×140 cm. Currently, the picture is in New York, in the Guggenheim Museum. Of course, this work belongs to the genre of abstract art, the most prominent representative of which was Wassily Kandinsky. For an artist, a circle is not only and not so much a geometric figure as a kind of universal conductor to another world. This closed figure at one glance connects us with this world, its form has no beginning, just as there is no end. Thus, Kandinsky presents a combination of circles of different sizes and colors as a combination of infinity, something cosmic and absolute. At first glance, the composition seems to be a chaotic collection of figures, but the longer you look at these circles, the clearer it becomes that each of them is in its place. On a dark background, spectacular, bright yellow, bright blue circles emerge here and there, black ones are superimposed over bright ones, and so on, layer by layer. In some ways, these figures resemble planets and luminaries moving in space. A glow is seen around one of the figures, which additionally enhances the similarity of circles with space objects. Bright colors, so beloved by the artist, make the imagination wake up. Intersecting, the circles get new shades and edges of color, the look I want to follow their fancy lines and overlays on each other. Love for the circle goes through all the work of Kandinsky from 1920 to 1930. The artist saw in the circle everything he wanted and sought: space, tension, force. The circle on his canvases is not even a circle, but a creature endowed with an inner voice and character. Simple geometry, thanks to Kandinsky, finds soul.